TASTE buds tingled with delight at a recent cooking demonstration in Arles Community Centre. 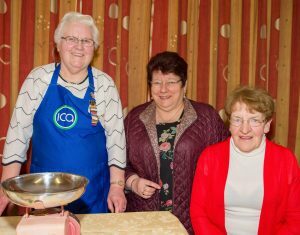 Award winner Vivienne Rigley cooked up a storm, giving everyone a taste of her famous brown bread, which won her third place at last year’s National Ploughing Championships. However, that wasn’t all that was on the menu, as she also cooked a four-course meal, which included soup, chicken and mushroom vol-au-vents. For her main dish, she made a chicken curry followed by rhubarb meringues for dessert. The demonstration was organised by the local ICA guild to promote fresh produce and lasted just over three hours. Vivienne is an ICA member and holds the title of “produce promoter” within the federation. Fellow members rolled up their sleeves and tied their apron strings to help with the demonstration, including ICA secretary Anna Mai Brennan. Commenting on the demonstration, Vivienne said: “I was a bit worried there wasn’t going to be enough, as we had more people than anticipated; we only expected around 30, but 43 attended. Everybody got to have a taste, which was fantastic”. “I had my work in front of me, but I love doing it, it was a terrific day,” added Vivienne.